The Seahawks open up their season on Friday, February 15th by hosting St. Joseph's and VMI for the weekend. Each of the 3 teams will get 4 games out of the weekend slate, starting with a noon game between VMI and St. Joe's. The Hawks had only one hitter who batted over .300 last season. Luckily, he returns in 2019. Senior 1B/OF Charlie Concannon led the team in batting (.317), RBI (29), OBP (.393), and Slugging (.483). The 2016 Louisville Slugger Freshman All-America will hope to build his draft stock in his final year of eligibility. Junior Catcher James McConnon will also be counted on in the middle of SJU's lineup, coming off a season where he hit .288 8 XBH and 16 RBI. Junior Outfielder Kadar Namey led the team in HR (6) and was 2nd in RBI (26), but only batted .195 with a .257 OBP. Speedster Matt Maul (14 SB) is gone, leaving the Hawks with precious few threats on the basepaths. The Hawks will need to replace their top 2 weekend starters, as Tim Brennan (9-3, 2.94 ERA) and Justin Aungst (2-9, 3.57 ERA) are both gone after getting the ball a combined 25 times for starts over the season. The likeliest Friday option will be sophomore Matt Kennedy. The big 6-8, 243 lbs right hander made 9 starts last season as the primary Sunday option, and posted a solid 34:14 K/BB ratio. Expect his ERA to drop from 5.24 as he learns to avoid the long ball (5 HR allowed) and hit batsmen (10). Top reliever Ryan Devine will slot in the most-used bullpen option and closer, after making a team-high 19 appearances last season. The sophomore righty had the team's best ERA (2.63), striking out 19 over 27.1 innings and converting a pair of saves. With Steve Powles (3 saves) gone, Devine will get even more work in 2019. After a pretty successful run through the Southern Conference regular season, VMI went 2 and out in the SoCOn tournament, and is now projected to take several steps back in 2019. The biggest reason for that is the team lost 7 of their top 9 hitters from the past season. Matt Pita (.389, 14 HR, 48 RBI), Matt Dunlevy (.339, 9 HR, 37 RBI), Will Malbon (.307, 8 HR, 39 RBI), Peyton Maddox (.304, 7 HR, 38 RBI), and Nathan Eaton (.287, 8 HR, 24 RBI) are all gone, and that group of 5 sluggers accounted for 69 % of the team's HR's. Eaton (36 SB), Pita (23 SB) and Dunlevy (12 SB) were also dangerous on the basepaths for the Keydets. The Keydets will look to pick up the pieces in '19, led by senior first baseman Jake Huggins, who hit .280 with 4 HR and 31 RBI in 2018. Huggins was the only Keydet to receive any preseason SoCon honors, picked to finish on the 2nd Team All-Conference. Meanwhile, sophomore second baseman Callen Nuccio didn't make his first appearance of the season until April, but did well in his 20 starts to finish the season. Nuccio hit .313 with 8 RBI, and helps solidify the right side of the infield for 2019. There were also heavy losses on the mound this offseason, as 3 of the team's top 4 starting pitchers are gone as well. The expected Friday starter will be the lone returner of that quartet, junior righty Zak Kent. Kent went 5-5 with a 5.88 ERA in his 14 starts, though he did sport an impressive K/BB ratio of 81:35. The other slots in the weekend/midweek rotation appear to be up for grabs. VMI also lost their closer, Matthew Eagle, who produced 7 saves in '18. Two-way performer Eaton picked up the other 2 saves for the 2018 Keydets. That leaves two returning right-handers to pick up the slack out of the bullpen. Redshirt junior Corey Johnston went 3-0 with a 5.45 ERA in 23 appearances, while junior Derek Tremblay made 24 appearances, posting a 2-2 record and a 5.86 ERA. The 2 pitchers combined for over 60 innings of work in 2018. Basically the expectation 2 weeks from now is that we come out of the opening weekend sitting at 4-0. But this is baseball we're talking about, and its unpredictable. Especially early in the season, when the weather is cold and roles aren't anywhere close to being defined yet. In that one, UNC was # 8, Coastal # 12, NC State # 22, and ECU # 35. (02-05-2019 01:14 PM)CG_Hawk06 Wrote: Waaaaaay too many polls. Normally I'd agree, but I'll take as many opportunities as we can get to be a ranked team over the course of the season and get some publicity. Traditionally, D1Baseball has been the most pro-UNCW of the 6 publications, with Baseball America giving us the least love. I'm planning on making a home series this year. It's going to be my last year to get down there for a while, since I'm officially transferring to Arizona this summer. Gonna look at the schedule and find some home games I like. I'd love to hang out at the games with as many of you as possible before heading west for several years. (02-05-2019 07:51 PM)CG_Hawk06 Wrote: I'm planning on making a home series this year. It's going to be my last year to get down there for a while, since I'm officially transferring to Arizona this summer. Gonna look at the schedule and find some home games I like. I'd love to hang out at the games with as many of you as possible before heading west for several years. Be sure to come out and tailgate with us. Two hours before each game. Elon enters 2019 with one of the most talented starting rotations in the country, which should carry the Phoenix in its pursuit for the program’s first NCAA Tournament appearance since 2013. Junior righthander Kyle Brnovich (8-2, 1.71, 147 SO) was an All-American last season and finished fourth in the nation in strikeouts, while rotation-mate George Kirby (10-3, 2.89, 96 SO) is considered the conference’s top 2019 draft prospect and a potential first-round pick this June. Both Kirby (No. 38) and Brnovich (No. 105) rank among Baseball America’s Top 200 Draft Prospects and were voted Preseason All-Americans by MLB scouting directors, while sophomore lefthander Jared Wetherbee (2-1, 4.07) could transition into the Sunday starter’s role after an effective freshman campaign in the bullpen. Righthanded relievers Brandon Justice (0-3, 1.08) and Ty Adcock (0-0, 6.94) should step into larger roles and anchor the back of the bullpen after the graduation of Robbie Welhaf, who was Elon’s top reliever in 2018. Offensively, Elon will have to replace some key pieces up the middle, as shortstop Ryne Ogren (.338/.451/.457), a 12th-round pick by the Mariners, and center fielder Zach Evers (.297/.401/.431) are gone. The Phoenix seem to have ready-made replacements, however, as junior Cam Devanney (.287/.411/.433) will slide from second base to shortstop after a second-team all-CAA season a year ago, and junior speedster Tyler Stanley (.189/.348/.351) takes over in center field with the ability to steal 20-plus bases. In total, Elon will have to rely more on elite pitching and solid defense, but the pieces are there for Elon to win its first conference title since joining the CAA in 2014. A 17th-round draft pick by the Orioles in 2017, Jones is a draft-eligible sophomore who could be a potential first-round pick this June. The switch-hitter has elite speed, which helps his range at shortstop but could also give him a future in center field, if needed. As a freshman in 2018, Jones was selected to the CAA all-rookie team after hitting .278/.412/.370 with 16 stolen bases, and he stole 20 bases in 37 games in the Cape Cod League this summer. If Jones’ hit tool takes a step forward this spring, he could be an offensive nightmare for opposing coaches, and his collection of raw tools is unrivaled in the CAA. An argument can be made for either Brnovich or Kirby as the conference’s pitcher of the year, but Brnovich was the better of the two pitchers last year and therefore has the inside track to this award as it stands. Armed with an 89-93 mph fastball, a plus slider and above-average changeup, Brnovich racked up 147 strikeouts in 105 innings last season, and he limited opponents to a miniscule .159 average. It may be hard for Brnovich to improve upon his 1.71 ERA and 0.89 WHIP from a season ago, but even if he can just match those numbers it will be hard for anyone to best him as this year’s CAA pitcher of the year. UNCW should have a number of candidates for freshman of the year honors, including versatile infielder Brooks Baldwin, who can play all over the infield and will likely get the starting nod at first base, and outfielder Chris Thorburn, who is an above-average defender with the ability to grind out at-bats. Unlike Baldwin and Thorburn, Lawson is a redshirt freshman who sat out all of 2018, and he has the chance to earn a spot in the Seahawks’ rotation. Sitting mostly 88-91 mph with his fastball, Lawson has some of the best pitchability on UNCW’s staff and shows good control of both his slider and changeup. Regular season conference champions in each of the past two seasons, Northeastern has yet to win a CAA tournament title but was selected as an at-large team to last year’s NCAA Tournament on the strength of a program-record 36-win season. The Huskies lost two key position players to the draft from last year’s team in 2018 CAA player of the year Charlie McConnell (.347/.425/.470, 37 SB) and shortstop Max Burt (.272/.327/.362, 11 SB), but they return a good mix of experienced talent that should be able to fill the gaps. Sophomore Ian Fair (.305/.386/.418) will take over for Burt at shortstop after winning CAA rookie of the year honors in 2018, and senior Cam Walsh (.265/.345/.305) will take on a bigger role in the outfield after leading the New England Collegiate Baseball League in hitting over the summer. Senior first baseman Jake Farrell (.342/.412/.631, 11 HR) is Northeastern’s best proven power hitter, while senior third baseman Ryan Solomon (.238/.345/.428, 8 HR) could provide coach Mike Glavine with yet another double-digit home run threat in the middle of the lineup. Pitching-wise, Glavine’s group has a chance to run 10-12 deep, led by senior righthander Tyler Brown (8-4, 4.68, 61 SO) and junior lefthander Sean Mellen (10-3, 2.28, 81 SO) at the front of the rotation. Senior lefthander Andrew Misiaszek (2-2, 2.70, 12 SV) brings stability to the back-end of the bullpen as a Cape Cod League all-star over the summer and is looking to build off a junior season in which he set a single-season program record for saves. Redshirt junior righthander Kyle Murphy (3-3, 3.33) last season was second on the team in appearances and gives the Huskies another proven option out of the bullpen. UNCW lost four pitches to last year’s draft—Austin Warren (sixth round, Angels), Alex Royalty (eighth round, Indians), Clark Cota (10th round, Athletics) and Austin Easter (31st round, Blue Jays)—as well as a pair of important power hitters in catcher Ryan Jeffers (second round, Twins) and first baseman Mason Berne (32nd round, Braves). Despite the losses on the mound, coach Mark Schalf’s club is expected to be deep with pitchers. The Seahawks return sophomore righthanders Gage Herring (2-1, 2.68) and Landen Roupp (0-3, 3.58), both of whom gained weekend starting experience as freshman, as well as junior righthander Luke Gesell (3-2, 3.37) who could transition from the bullpen to the front of the rotation in 2019. The loss of Jeffers and Berne, who combined to hit 28 of the team’s 54 home runs last season, likely means the Seahawks will have to rely more on speed and contact ability to score runs. 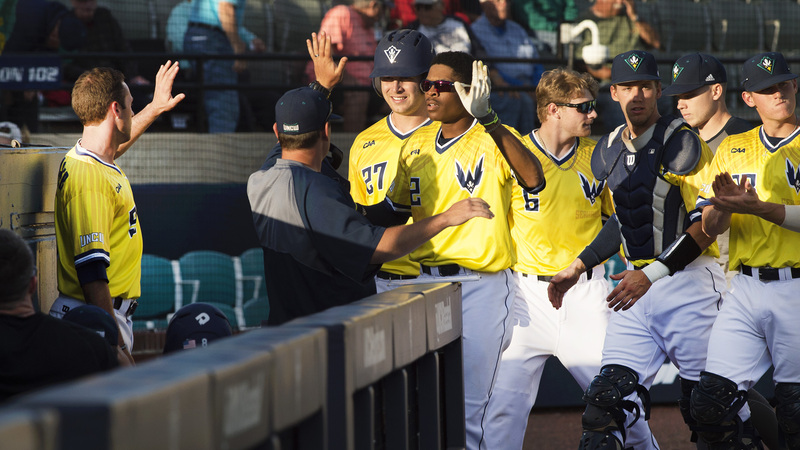 While that offensive philosophy aligns nicely with the skill set of Jones, UNCW will also rely heavily on the likes of junior infielders Jackson Meadows (.252/.302/.272) and Cole Weiss (.264/.335/.357) taking a step forward, as well as outfielders Noah Bridges (.247/.307/.313, 14 SB) and Kep Brown (.267/.323/.459, 7 HR). Entering year two of the Chad Holbrook-era, College of Charleston must replace major production from pitchers Evan Sisk (10-3, 2.96), Carter Love (7-0, 1.38) and Justin Baker (1-2, 1.59), who combined to throw more than 200 innings in 2018. However, senior righthanders Griffin McLarty (7-2, 3.32) and Jakob Frishmuth (4-4, 3.68) both have extensive starting experience, and senior righthander Nathan Ocker (4-0, 2.38, 10 SV) is an experienced weapon in the back of the bullpen. The Cougars lost outfielder Luke Morgan (.326/.393/.496, 20 SB) to the draft, but senior Dupree Hart (.326/.402/.434, 15 SB) is a dynamic offensive player and a plus defender at second base. Hart’s double-play partner, senior Luke Manzo (.241/.333/.299) is also strong with the glove, and the Cougars, in total, should be a strong defensive team. Senior catcher Danny Wondrack (.253/.367/.516, 12 HR) and junior first baseman Ari Sechopolous (.273/.370/.591, 9 HR) combined for 21 home runs a year ago, giving Charleston some much-needed power in the middle of its lineup. Baseball America sure puts a lot of stock in MLB prospects equating to college team success. That always heavily influences their rankings/projections. Not that I'm complaining. I prefer UNCW not getting picked to finish 1st. (02-07-2019 08:36 AM)Seahawk Nation 08 Wrote: Baseball America sure puts a lot of stock in MLB prospects equating to college team success. That always heavily influences their rankings/projections. That usually means they are basing a college teams field results based on pro scouting reports. I see that as a flawed approach when it comes to college baseball. Greg Jones will be as good as he wants to be but the scouting reports are based on a lot of numbers and the numbers look great. Does he want to be great is the question I think. If he does and he plays like it UNCW will be that much better. As always the pitching will be the key to success. Does UNCW have enough arms to compete when the bats are not going? Agreed. And since Scalf has shifted his philosophy towards getting as many arms as possible on the recruiting trail, its worked really well. So I think the answer to that will be a resounding yes. It just might take a little time for that to come to fruition, given that we're basically operating with a brand new weekend rotation and middle relief group. WILMINGTON, N.C. – Led by four preseason all-Colonial Athletic Association honorees, UNCW was picked to finish tied for second in the CAA's preseason predicted order of finish the league announced on Thursday. The defending CAA tournament championships landed four players on the preseason All-CAA squad including sophomore shortstop Greg Jones, junior third baseman Cole Weiss, red-shirt junior outfielder Kep Brown and junior Jackson Meadows, who split time between the outfield and infield as a sophomore. Elon, which received four first-place votes, topped the preseason poll with 57 points while the Seahawks and Northeastern both had 54. The Huskies, who won the 2018 regular season title, also received four first-place votes. Rounding out the top six were Charleston, Delaware and James Madison. Elon junior righthander Kyle Brnovich was selected as the league's preseason player-of-the-year. The Seahawks open the 2019 season on Feb. 15, when they host Saint Joseph's at 4 p.m.
RICHMOND, Va. (February 7, 2019) – Elon has been picked to win a competitive race for the CAA baseball title in 2019 according to a vote of the league’s head baseball coaches. The Phoenix received four first-place votes and finished atop the poll with 57 points. Following close behind in a tie for second with 54 points were defending CAA champion UNCW, which got one first-place vote, and back-to-back regular-season champion Northeastern, which picked up the other four first-place votes. Charleston was fourth with 47 points, followed by Delaware (34 points), James Madison (32 points), William & Mary (19 points), Hofstra (14 points) and Towson (13 points). Elon returns five starters and several top pitchers from last year’s 36-23 squad that placed second in the CAA standings. The Phoenix pitching staff is headlined by a pair of preseason All-America honorees in junior right-handers Kyle Brnovich (8-2, 1.71 ERA, 147 K’s) and George Kirby (10-3, 2.89 ERA, 96 K’s). The bullpen includes Jared Wetherbee (2-1, 4 svs., 4.07 ERA) and Brandon Justice (0-3, 2 svs., 2.13 ERA). Three all-conference selections are back in the Elon lineup with infielders Cam Devanney (.287, 5 HR, 23 RB) and Joe Satterfield (.268, 4 HR, 43 RBI) and designated hitter Garrett Stonehouse (.268, 2 HR, 38 RBI). UNCW welcomes back five starters from last year’s 39-23 team that captured its fifth CAA championship and advanced to the finals of the NCAA Greenville Regional. Leading the Seahawks offensively are sophomore shortstop Greg Jones (.278, 45 R, 21 RBI, 16 SB), junior third baseman Cole Weiss (.264, 4 HR, 29 RBI) and junior outfielder Kep Brown (.267, 7 HR, 30 RBI). Weiss made the All-CAA second team a year ago, while Jones was a CAA All-Rookie pick. On the mound, UNCW will rely on starters Gage Herring (2-1, 2.68 ERA) and Luke Gesell (3-2, 3.37 ERA), as well as relievers Henry Ryan (3-0, 1.11 ERA) and Justin Walke (4-1, 3.32 ERA). Northeastern looks to build on a historic 2018 campaign in which it set a program record for wins with a 36-21 mark, captured a second straight CAA regular-season title and earned an NCAA Tournament berth for the first time since 2003. Six players are back in the Huskies lineup, led by all-conference standouts Jake Farrell (.342, 11 HR, 63 RBI) and Ryan Solomon (.238, 8 HR, 30 RBI) as well as CAA Co-Rookie of the Year Ian Fair (.305, 2 HR, 27 RBI). Northeastern also returns starting pitchers Sean Mellen (10-3, 2.28 ERA, 81 K’s) and Tyler Brown (8-4, 4.68 ERA) along with relievers Andrew Misiaszek (2-2, 12 svs., 2.70 ERA) and Kyle Murphy (3-3, 5 svs., 3.33 ERA). Charleston, which went 36-19 in its first year under coach Chad Holbrook, returns a trio of All-CAA players with second baseman Dupree Hart (.326, 2 HR, 21 RBI), catcher Danny Wondrack (.253, 12 HR, 43 RBI) and designated hitter Logan McRae (.284, 7 HR, 37 RBI). Back on the mound are starter Griffin McLarty (7-2, 3.32 ERA, 85 K’s) and reliever Nathan Ocker (2-4, 10 svs., 2.03 ERA). Elon’s Brnovich was selected as the preseason Player of the Year and headlined the preseason All-CAA squad. So Elon gets 1 preseason all-Conference, and we get 4. Yet we only get 1 first-place vote, and Elon is picked to win the league. That makes a lot of sense. Again, no worries though. I prefer getting overlooked! (02-07-2019 12:11 PM)Seahawk Nation 08 Wrote: So Elon gets 1 preseason all-Conference, and we get 4. Yet we only get 1 first-place vote, and Elon is picked to win the league. That makes a lot of sense. I agree with your sentiment about being over looked. In regards to Elon, it appears they are putting a lot of stock in returning, very good starting pitching. Their picked to have two dominant starters. Speaks more to 08's point that sure, they have two dominant starters... but what else? Those guys aren't going to be locked on and smoking in EVERY outing. So inevitably, they'll have their losses. Does Elon have enough in the other 8 positions on the field and in the pen to keep pace with teams with more balance? If you win 2 of every three you would likely win the conference. I'm not saying i agree, just saying that's likely what their thought process was. In regards to the other 8 positions, they return 5 from a very good team last year. So do we... and we won the conference.